The last day with my scope of 16" towards NGC 40. The changes are very different from my old 10". In the search at 145x the central, bright, planetary star with an oval shape appears and what I call the shell on each side. Interchanging several eyepieces changing with both NPB and OIII filters, I concluded that I was not going to use any, some small detail as brightness decrease in the lower part of the central star, in addition to a small outline marked on the outside of the shell, but it was not relevant, I decide to use only 400x magnification. It shows a decrease in brightness inside as well as before, on its right and left, the latter being more significant. The lower shell is much brighter and more profiled, with a more defined outline, where right in the center it has a brighter clump. A star appears near the edge of the lower left shell. The upper shell has something less bright and is somewhat less profiled but it is completely visible, any detail mentioned above with avoided vision intensifies much more. It is one of those objects that the opening makes a very obvious significant change. How about your review with this object in different scope ? 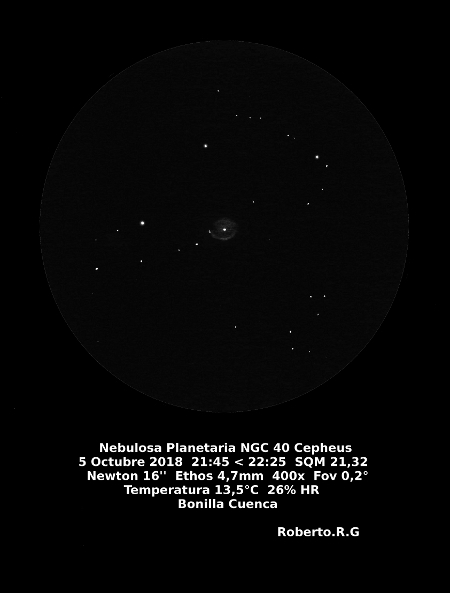 I’ve tried observing NGC 40 (Bow-tie Nebula) several times with an 11” f/4.5 dob but without success. The issue I think was lack of magnification. I think the 36” x 36” size reported in Sky Safari must include a very rarified outer envelope and that your size of 1.2” is a different measure. Maybe. But my notes report it as an easy, obvious fuzzy spot at 32X through my 7-inch Dob from my club's exurban observing field. On the other hand, those same notes go on to say that the central star is so bright that it tends to drown out the nebula at 105X, unless you use a nebula filter. Here is my observation with an TN 25" Obsession, in a good sky. NGC40 (m10.6; 38" x 35") is bright, fairly large, almost round, less annular than some PN's but with a bit darker center and has a very bright (m11.5) central star. The outer halo is easily seen and the rim has varied brightness and thickness. Last year I observed it in my 16" f4.49 Dob and about an hour later had an opportunity to observe it in Larry's brand new 20" f3.3 Teeter. Magnifications were similar at around 350x, both unfiltered and with Lumicon UHC, and the difference in the view through the larger scope was quite significant. The halo's structure showed more detail more easily. Both scopes showed a blue-green-ish tint. 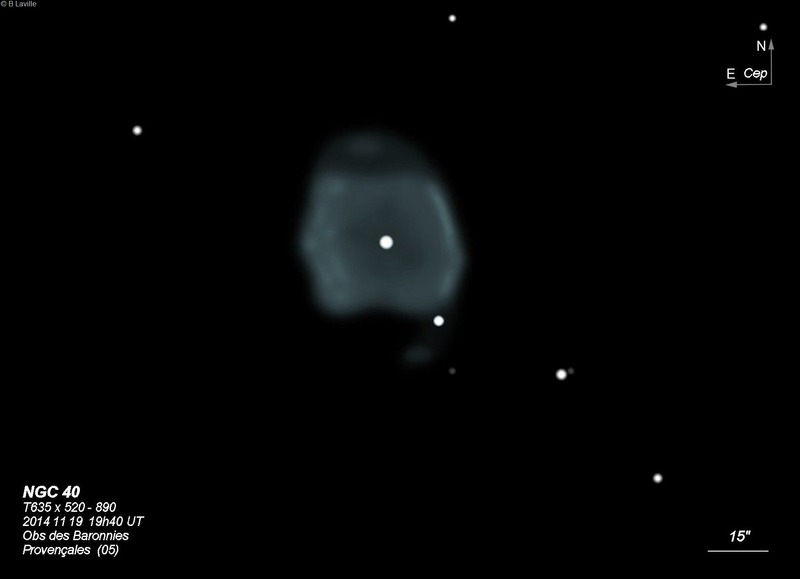 NGC40 was very easily seen via either scope. Quite a few years ago I had the opportunity to view NGC 40 and its Wolf-Rayet-like central star through a 20" classical Cassegrain and a Rainbow Optics Star Spectroscope diffraction grating. Wolf-Rayet-like stars within planetary nebulae are labeled WC instead of WR. NGC 40 displays a noticeable hue through larger apertures. If it is a mistake in the size, ski safari indicates 0.6x 0.6 arc. In other places in form an apparent size of about 1.2 by 0.75 arcmin for the bright central portion of the nebula. NGC 40 was one of the last DSOs that I observed this morning with the ASH 17" classical Cassegrain. Unfortunately, the conditions, which weren't that great to begin with, had deteriorated considerably and the sky was filled with cirrus clouds by that time. I could see the nebula but it was obscured quite a bit. It was the first "clear" night here in some time so I had to take advantage of it.